Your kidneys work very hard, why not show them a little love? 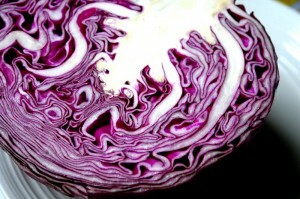 Purple cabbage has a vibrant beautiful color when juiced and tastes quite sweet, unlike green cabbage which can be a tad more bitter. Cabbage is a master healer to the gut and digestive system, and loaded with phytonutrients known to guard against cancer and cleanse your kidneys too. This recipe can be found in our 14 Day Juice Challenge App, consisting of nearly 60 healing juice recipes, health guides + more. Directions: Run all ingredients through a juicer. Enjoy!